Amidst the billions of stars in the Milky Way, astronomers have witnessed the evolution of one as it exploded in what's known as a classical nova after hibernating for years, according to a new study(PDF). It is the first time the transition of a white dwarf star with a low and unstable mass-transfer rate to a classical nova eruption has been observed, study author Przemek Mróz said. "Classical novae attract attention during eruptions, when they are bright and easy to observe," Mróz said. "Because of their unpredictable nature, very little is known about pre-eruption behavior of novae. This is the first case that the evolution of a classical nova can be investigated so precisely with long-term pre- and post-eruption observations." 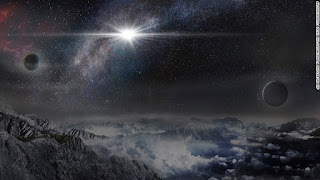 The classical nova occurred in a binary star system in the Milky Way's Centaurus constellation, 6,300 light-years from Earth.In a close binary star system where two stars orbit each other, a white dwarf star is paired with a red dwarf star. A classical nova occurs when a white dwarf star gains matter from its secondary star over a period of time, causing a thermonuclear reaction on the surface that eventually erupts in a single visible outburst. This creates a 10,000-fold increase in brightness. Mróz said astronomers observe five to 10 classical novae in the Milky Way each year, but most of them are faint, because they are hidden behind interstellar gas and dust. He cited recent examples like Nova Sagittarii 2015 and Nova Delphini 2013.But based on long-term observations, this white dwarf star experienced periodic brightening over six years leading up to the explosion. This implies that during that time, a low mass-transfer rate was occurring between the two stars, causing that fluctuation. Six days before the eruption, there was another fluctuation in brightness. And after the explosion, the mass-transfer rate increased. Now, the system remains bright but is slowly fading, which will continue for a few decades as the process begins again. The observation of this process is further evidence of the hibernation hypothesis, which suggests an evolutionary cycle of high and low mass-transfer rates between the two stars in between cataclysmic events. Researchers have long believed that the process could happen over a period of time, but they didn't expect to witness it during a human lifetime, Mróz said. Although this seems like it happened fairly quickly, we're talking about stars: These building blocks of the universe can take thousands or even millions of years to evolve. This observation was all by chance. As it turns out, having two different telescopes in Chile pointed in the right direction for other reasons allows for serendipitous discoveries. In 2005, the Very Large Telescope was studying a potential exoplanet that happened to be in the same vicinity as V1213 Cen, a binary star system in the Centaurus constellation. Its image was captured, effectively creating a time stamp of the white dwarf star and its red dwarf star. Fast-forward to 2009. The Optical Gravitational Lensing Experiment (OGLE), a Polish astronomical project that aims to discover dark matter, was nearly done with phase three of its telescope monitoring of the skies from Las Campanas Observatory in Chile. A new camera was installed before phase four, which is ongoing, started in 2010. This enabled researchers to make better observations of the star after the explosion. This long-term observation captured the same area before, during and after the classical nova occurred in 2009. Due to movement, the binary star system wasn't observed by OGLE in 2005. But the Very Large Telescope had that missing puzzle piece. By stacking images of the waxing and waning of the star over this time period, researchers were able to record the behavior and evolution of what is now known as Nova Centauri 2009. "This discovery would be impossible without long-term observations by the OGLE survey," Mróz said. "The survey started almost 25 years ago, and for 20 years, we have a dedicated 1.3-meter telescope at Las Campanas Observatory in Chile. And I have to say that we were very lucky, because the nova was observed by chance with the VLT in 2005. These data were crucial for us and allowed us to measure the nova brightness at minimum light." Meanwhile, OGLE continues to monitor the star system. Mróz hopes researchers can make near-infrared observations of the secondary star. Then, they can investigate more about the little instigator that disturbed its sleepy white dwarf star companion and heaped enough matter on its surface to cause a blinding temper tantrum in their corner of the universe.